Owners of Azimuth points need safeguards that allow for the use of Urbit without jeopardizing cryptographic ownership of their assets. Toward this end, we created the Urbit Hierarchical Deterministic (HD) Wallet for the storage of points. 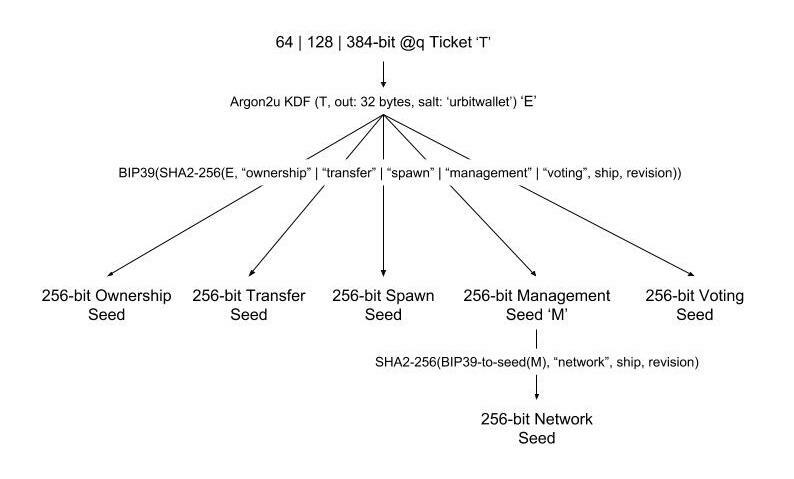 The Urbit HD Wallet is not one key-pair, but a system of related key-pairs that each have distinct powers, from setting networking keys for communicating in the Arvo network to transferring ownership of points. The Urbit HD Wallet's derivation paths have a hierarchical structure, so that keys with different powers can be physically separated. A "master ticket" can re-derive the entire wallet in case of loss. The encryption and authentication keys that points ships use to sign messages within the network are also derived from the wallet. Urbit HD wallets are composed of the following items, which are each assigned to their own individual Ethereum key-pairs. Think of your master ticket like a very high-value password. The master ticket is the secret code from which all of your other keys are derived. Technically, your master ticket is seed entropy. You should never share it with anyone, and store it very securely. This ticket can derive all of your other keys: your ownership key and all of the related proxies. An ownership address has all rights over the assets deeded to it. These rights are on-chain actions described and implemented in the Ecliptic, Azimuth's suite of governing smart-contracts. Proxy addresses allow you to execute non-ownership related actions like spawning child points, voting, and setting networking keys without jeopardizing the keys you've designated with ownership rights. Setting proxy rights is optional, but it is recommended for on-chain actions you will execute more frequently. Can configure or set Arvo networking keys and conduct sponsorship related operations. Galaxies only. Galaxies are the part of the galactic senate, and this means they can cast votes on new proposals including changes to the Ecliptic. For stars and galaxies only. Can create new child points. Most Ethereum tokens use the ERC-20 standard for smart contracts. Azimuth points are, however, essentially different from most Ethereum tokens, due to points not being fungible. Since any two stars will handle social-networking realities in a different way, they will carry a different reputation. Points are to houses as tokens are to gold. The ERC-721 standard, having been made specifically to provide a smart-contract interface for non-fungible assets, serves our needs well. This is the standard that we use for deeding Azimuth points. Points, and all of their blockchain operations, are governed by the Ecliptic. The Ecliptic is an Ethereum smart-contract that governs point state and the ownership, spawn, management, and voting rights affiliated with your points. For the technical implementation details Azimuth, take a look at the Github repo.